Very amusing! Should we draw straws to see which "30 persons" get to make it? Trivia: The ship "City of Flint" was the first US boat sunk by Germany in the beginning of World War II. Wonder if this is a lifeboat from that era. 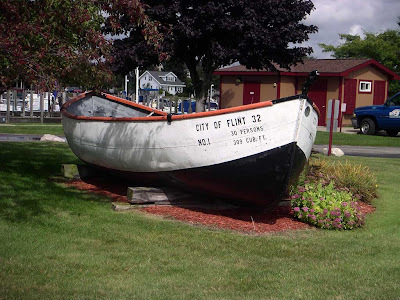 Very late to this discussion, obviously, but the "City of Flint 32" was a Lake Michigan carferry, which would explain why one of her lifeboats is in Ludington.